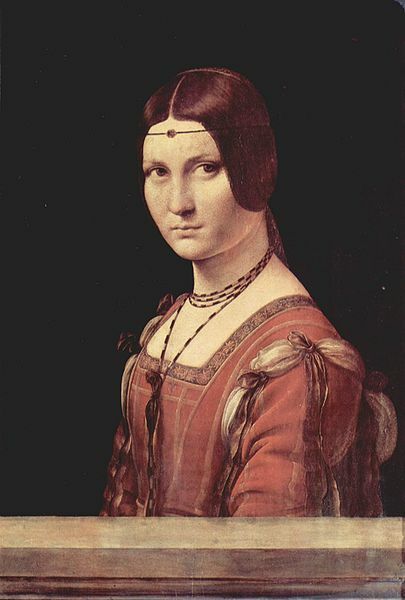 La Belle Ferronnière – The Term Ferroniere is Derived from the Jewel on Her Forehead. Musée du Louvre, Paris. Attributed to the School of Leonardo da Vinci in Milan. The ferronnière was a delicate jewelry item worn by women on the forehead which served to help hold hairstyles in place. It consisted of a chain with fine links – or a textile thread – usually with a single gemstone in the center. 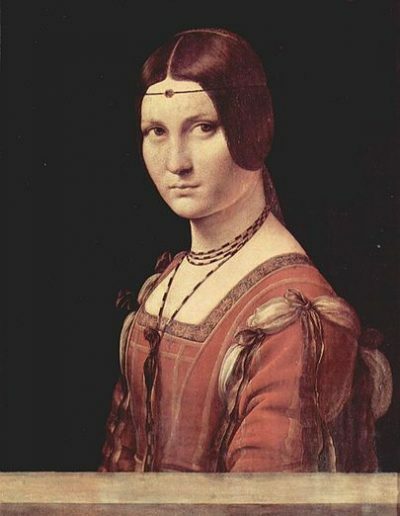 The name is derived from a painting, attributed to Leonardo da Vinci, named La belle ferronnière (from French: “the beautiful blacksmith’s wife”) currently in the Musée du Louvre, Paris. This Renaissance fashion was revived shortly during the 19th century c.1830-1845. Costume balls were a popular entertainment from the 1820s and portraits were popular sources for inspiration both for clothing and for accessories. Adapted from these portraits, the ferronnière started out as a costume accessory but quickly became a fashion necessity. Hairstyles featured face hugging center-parted looks that were perfect for a ferronnière. Most of these featured an articulated jeweled drop but occasional designs featured an upright central motif.